A review on computational studies of carbon nanostructures and related materials, part of a special issue of Advanced Materials dedicated to the centennial of Rice University. Unfolding the Fullerene: Nanotubes, Graphene and Poly-Elemental Varieties by Simulations. E. S. Penev, V. I. Artyukhov, F. Ding, and B. I. Yakobson. Adv. Mater. 24, 4956-4976 (2012). A paper in PNAS investigating the atomistic mechanisms of graphene synthesis viewed as a crystal growth process. Equilibrium at the edge and atomistic mechanisms of graphene growth. V. I. Artyukhov, Y. Liu, and B. I. Yakobson. Proc. Natl. Acad. Sci. U.S.A. 109, 15136-15140 (2012). HOUSTON – (Sept. 4, 2012) – Like tiny ships finding port in a storm, carbon atoms dock with the greater island ofgraphene in a predictable manner. But until recent research by scientists at Rice University, nobody had the tools to make that kind of prediction. Electric current shoots straight across a sheet of defect-free graphene with almost no resistance, a feature that makes the material highly attractive to engineers who would use it in things like touchscreens and other electronics, said Rice theoretical physicist Boris Yakobson. He is co-author of a new paper about graphene formation to appear this week in the Proceedings of the National Academy of Sciences. To examine exactly what happens at the atomic level, Yakobson and his Rice colleagues took a close look at the now-common process called chemical vapor deposition (CVD), in which a carbon source heated in a furnace is exposed to a metal catalyst to form graphene, a single-atom layer of pure carbon. Yakobson, Rice’s Karl F. Hasselmann Professor of Mechanical Engineering and Materials Science and professor of chemistry, and his colleagues calculated the energies of individual atoms as they accrete to form graphene at the “nanoreactor” dock where the carbon vapor and catalyst meet. With the help of theories long applied to crystal growth, they determined that, at equilibrium, some patterns of graphene are more likely to form than others depending on the catalyst used. One hitch has been that the edge of a graphene sheet dictates how — or even if — current may proceed to an electrode. Grain boundaries — transitions in the hexagons’ angles that appear when islands of graphene merge during growth — can also derail electrons. Yakobson said these edges and boundaries determine the sheet’s overall electronic, mechanical and magnetic properties, so knowing the conditions under which graphene would favor edges that look like zigzags or armchairs – or some angle in between – is important to researchers who want to grow the material for use in electronic components. Yakobson and his co-authors, research associate Vasilii Artyukhov and graduate student Yuanyue Liu, drew upon their knowledge of crystal growth for their nanoreactor theory. They present a comprehensive model of how atoms migrate from the feedstock – usually a carbon-rich mist in a CVD furnace (and sometimes, famously, a cookie) – to the catalyst and finally to the graphene lattice. “Owing to the talents and efforts of materials chemists, graphene now grows like mold on almost anything, and from almost any feedstock,” Yakobson said. “But how it looks and the shape it takes is hard to understand or predict. “If you spill a little water on a flat, horizontal table, it will form a little puddle of circular shape, because water isisotropic – all directions are identical, and a circle has the smallest perimeter and therefore the lowest-energy shape,” he said. That sounds like the way a crystal grows, a property not lost on the researchers. The ultimate shape of graphene depends on the subtle interplay of energies and speed of growth. Like water, atoms take the path of least resistance, and that path can change due to slight temperature changes and variations in the carbon vapor density. “As carbon is added in CVD growth, different sides advance with different speeds,” Yakobson said. The team used density functional theory to calculate the formation of graphene for all possible edge orientations on various catalysts, including nickel, iron, copper and cobalt. They found the energy levels of atoms can be mapped, step by step, as they leave the vapor and join the lattice at a nanoreactor. A sheet of graphene starts to form when the first few carbon atoms attach to the catalyst and establish a nucleus around which atoms continue to settle. 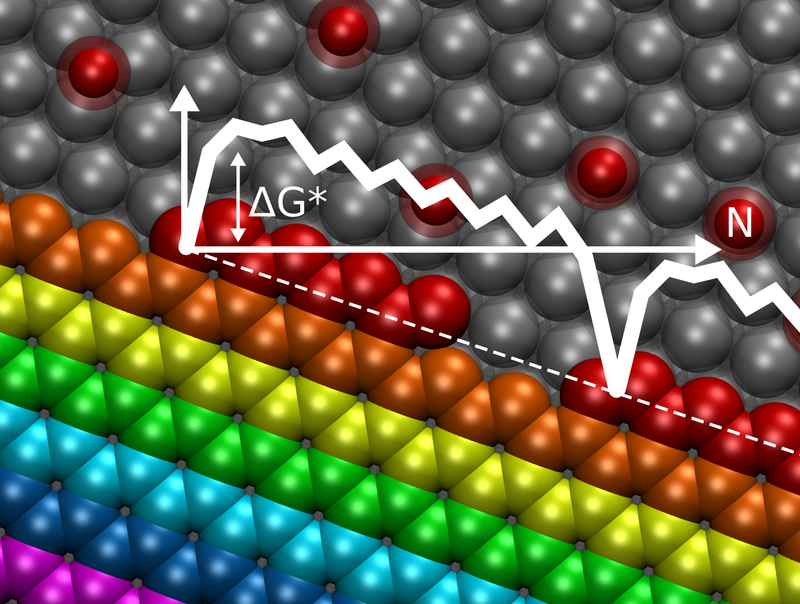 The graphene grows in rows as new atoms are added, but the rows don’t have straight edges. Some have a zigzag pattern, others form a more complex shape that scientists call armchair. The shape of the edge pattern is dictated by the most efficient use of energy. The Rice team found that zigzag edges face a high-energy barrier at the start of a new row, but the rest of the row’s atoms fall into line quickly and easily. For armchairs, the initial barrier is smaller but remains the same for every subsequent atom that docks. Skewed edges – in between zigzag and armchair – grow fastest of all, because they have the smallest energy barrier to overcome to start or complete a row, Liu said. Also interesting, he said, is the finding that carbon vapor with atom pairs called dimers might prompt faster and better-quality graphene growth. The researchers found the lagging zigzag edges are a bottleneck that, independent of the metal substrate, helps determine the overall shape of a graphene bloom. Other kinetic factors can also lead to variations that produce stars, flowers or asymmetric shapes. The researchers were surprised to find that open-pentagon armchair edges are the most likely growth pattern under equilibrium on iron, cobalt and nickel, while zigzag edges were especially pronounced on a copper catalyst. They also found mathematical evidence that certain defects, in which five- and seven-atom polygon pairs replace adjacent hexagons, are unlikely to form except in a vacuum, an unrealistic scenario for graphene growth. That puts the new theory in line with Yakobson’s previous work to show how unlikely defects are to form when growing carbon nanotubes. Yakobson said the theory advances on one the carbon-growth community considers canonical — the vapor-liquid-solid paradigm — by getting right down to the smallest details. The work was supported by the Office of Naval Research, the Air Force Office of Scientific Research and the Robert Welch Foundation. Computations were performed with National Science Foundation support using Rice’sData Analysis and Visualization Cyberinfrastructure (DAVinCI), the Kraken supercomputer at the National Institute for Computational Sciences and the Hopper supercomputer at the National Energy Research Scientific Computing Lab at Lawrence Berkeley National Lab. The paper is available freely at www.pnas.org/cgi/doi/10.1073/pnas.1207519109 (Open Access).